When the light control switch is in the AUTO position, the automatic light control system detects ambient light levels and controls the low beam headlights, parking lights, taillights, marker lights and license plate lights. The light auto turn-off system is used to prevent the exterior lights from being accidentally left on (low beam headlights, high beam headlights, front fog lights, taillights, parking lights, license plate lights and marker lights). This system has the following functions. The ignition switch is turned from ON to off. The light control switch is in the tail position. The low beam headlights are on (Light control switch is in the head or AUTO position). All doors are closed after any of the doors are opened. The lock button on the key is pushed after all doors are locked. The daytime running light system is designed to automatically illuminate the dimmed high beam headlights during the daytime to make the vehicle more visible to other vehicles. There are 2 LED type parking light circuits in each headlight. One is for a conventional low-intensity parking light that illuminates with the taillights, and the other is for the high-intensity parking light that is used for the DRL system. This system is controlled by the main body ECU (driver side junction block assembly) and power distributor (engine room junction block assembly). The main body ECU (driver side junction block assembly) transmits a turn on signal to the power distributor (engine room junction block assembly), which illuminates the high beam headlights using duty control. Light control switch is in the off, tail or AUTO position (and the low beam headlights are not turned on via the automatic light control system). The daytime running light system is designed to automatically illuminate the daytime running lights during the daytime to make the vehicle more visible to other vehicles. This system is controlled by the main body ECU (driver side junction block assembly) and power distributor (engine room junction block assembly). The main body ECU (driver side junction block assembly) transmits a turn on signal to the power distributor (engine room junction block assembly), which illuminates the high-intensity parking lights. The automatic high beam system enhances the illumination of the area to the front of the vehicle to improve visibility for the driver. It works by detecting light from the front using the camera built into the inner rear view mirror assembly and turning the high beam headlights of the headlights on or off automatically. Determines when to turn the high beam headlights on and off after identifying the lights of oncoming vehicles, preceding vehicles and other lights from the picture information of its camera sensor. Then, it sends high beam request signals to the AFS ECU (headlight swivel ECU assembly) via LIN. Acts as the gateway between the automatic high beam sensor (inner rear view mirror assembly) which uses LIN communication and the CAN No. 2 bus. In addition, it stores Diagnostic Trouble Codes (DTCs) if an automatic high beam sensor (inner rear view mirror assembly) malfunction occurs. Even though the vehicle is not equipped with AFS, an AFS ECU (headlight swivel ECU assembly) is provided. Performs the gateway function between the No. 1 bus and No. 2 bus. Outputs the steering angle information to the AFS ECU (headlight swivel ECU assembly). Outputs the information about the speed of the right front wheel . This information is used by the automatic high beam sensor (inner rear view mirror assembly) to turn the high beam headlights on and off. Outputs a signal to indicate that the shift lever is in R. Based on this signal, the automatic high beam sensor (inner rear view mirror assembly) turns the high beam headlights off. Displays automatic high beam indicator light when it receives illuminate or blink request signals from the main body ECU (driver side junction block assembly). The automatic high beam indicator light flashes to inform the driver when the malfunction is in this system. The automatic high beam indicator light illuminates to inform the driver when the automatic high beam system is activated. The automatic high beam indicator light will turn off when there is bad weather (deep fog, heavy rain, etc. ), an abnormal condition with front windshield (snow, ice, etc. ), or an obstruction to the camera field of view (parking tag, etc.). Receives the light control switch AUTO position and dimmer switch high position signals from the headlight dimmer switch assembly, and receives the automatic light control sensor signal to determine the low beam headlight illumination condition, and sends this information to the AFS ECU (headlight swivel ECU assembly). These are used to put the automatic high beam system in standby mode. Receives high beam drive request signals from the AFS ECU (headlight swivel ECU assembly), and outputs the a duty control value to the power distributor (engine room junction block assembly). Performs illumination control for the automatic high beam system and stores Diagnostic Trouble Codes (DTCs) when the system malfunctions. Performs duty control for the high beam bulbs based on drive request signals that are received from the main body ECU (driver side junction block assembly). The light control switch is in the AUTO position and the low beam headlights are on. The dimmer switch is in the high position. Vehicle speed is more than approximately 20 mph (32 km/h). The area in front of the vehicle is dark. There are no oncoming vehicles with headlights on. There are no preceding vehicles with taillights on. There are few streetlights along the street ahead. Vehicle speed is less than 20 mph (32 km/h). The level of ambient light is higher than a specified threshold. There are oncoming vehicles with headlights on. There are preceding vehicles with taillights on. There are several streetlights along the street ahead. (4) When any of the following conditions are met, the automatic high beam system will be canceled and the indicator light will turn off. The ignition switch is turned off. The light control switch is turned to any position except the AUTO position. The light control switch is in the AUTO position, however the low beam headlights are not on. The dimmer switch is moved to the low position. Turn the light control switch from the auto position to the head position. In this case, the high beam headlights turn on according to the dimmer switch high position. To change to the low beam headlights, move the dimmer switch to the low position. Move the dimmer switch from the high position to the low position. In this case, the low beam headlights turn on according to the dimmer switch position. When an oncoming vehicle suddenly appears at a sharp curve or a vehicle crosses the path of the vehicle, the high beam headlights may remain on. When the fog lights of an oncoming vehicle are detected, the high beam headlights may be turned off. The timing of the high beam headlights turning on and off may differ depending on the brightness of headlights or fog lights from oncoming vehicles or the taillights of preceding vehicles. The timing of the high beam headlights turning on and off may differ between normal conditions (good weather) and when driving on wet, frozen or snowy roads. The timing of the high beam headlights turning on and off may differ depending on the number of occupants and amount of cargo present. On some occasions, the high beam headlights and low beam headlights may change unexpectedly. The camera built into the inner rear view mirror assembly continually monitors the light level in the area to the front of the vehicle. There is a delay in turning on the high beam headlights. Even when there is no ambient light, the high beam headlights will not turn on immediately. The delay will vary depend on the situation. (a) The models with HID (High Intensity Discharge) headlights have a Bi-function. This Bi-function increases the upper illumination area of the discharge bulb (low/high beam) when the high beam is turned on. 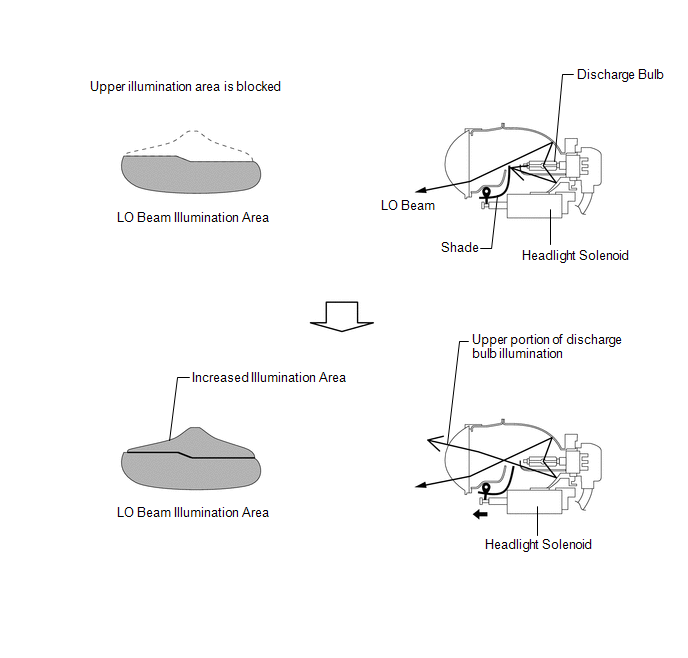 If the low beam is selected, the upper illumination area of the discharge bulb is blocked by a shade and only the lower illumination area is used. If the high beam is selected, the headlight solenoid slides the shutter (shade) down to allow use of the upper illumination area, thus increasing the illumination area and improving visibility when the high beam is on. This function is activated by the front controller. The front controller receives a high beam turn ON signal from the main body ECU RH and activates the headlight solenoid built into the headlight unit to slide the shade down. The High Intensity Discharge (HID) headlight system uses a discharge bulb as its light source for the low beam. Discharge bulbs are superior to halogen bulbs. The light emitted by the bulb is close in color to sunlight. The light shines further forward and over a broader area, increasing the area visible to the driver. This system consists of the discharge bulbs and light control ECUs. The light control ECU transforms voltage that is input from the battery to high voltage of up to 30000 V and applies it to the discharge bulbs in order to illuminate them. This system maintains the low beam headlights at a constant level while the vehicle is stopping. This system is controlled by the headlight leveling ECU assembly. The headlight leveling ECU assembly detects the vehicle posture via the rear height control sensor sub-assembly RH, and detects the vehicle speed via the combination meter assembly. The headlight leveling ECU assembly controls each headlight leveling motor (headlight unit) based on these pieces of information in order to change the headlight reflector angle. Initialize the rear height control sensor sub-assembly RH signal after the vehicle height changes due to replacement of the suspension or after operations as reinstallation or replacement of the rear height control sensor sub-assembly RH. When the headlight leveling ECU assembly is replaced, initialization is also necessary. Outputs the vehicle speed signal to the headlight leveling ECU assembly. The headlight beam level control system indicator light in the combination meter illuminates for 3 seconds and then goes off when the ignition switch is turned to ON (bulb check function). The headlight beam level control system indicator light in the combination meter illuminates to alert the driver when a malfunction in this system is detected. Based on the signals received from the headlight leveling ECU assembly, each motor moves the reflector in the headlight to vary its low beam. Based on the signals that are transmitted by the rear height control sensor sub-assembly RH and combination meter assembly, the headlight leveling ECU assembly detects the amount of variance of the vehicle posture while the vehicle is stopping. Based on the detected value, the headlight leveling ECU assembly outputs control signals to the headlight leveling motor (headlight unit). The headlight leveling ECU assembly turns on the headlight beam level control system indicator light for 3 seconds when the ignition switch is turned to ON (bulb check function). The headlight leveling ECU assembly turns on the headlight beam level control system indicator light to alert the driver when a malfunction in this system is detected. The door mirror foot light control consists primarily of the fade-in/fade-out function and timer illumination function. This control is controlled by the main body ECU (driver side junction block assembly). The ignition switch is off. A key is detected in the actuation area. A key is not detected in the actuation area. Any door is unlocked when all doors are locked. All doors are locked when all doors are closed and any door is unlocked. All doors are locked again when all doors are closed and locked. An actuation area-linked function is used. A door unlock-linked function is used. The shift lever is in any position other than P.